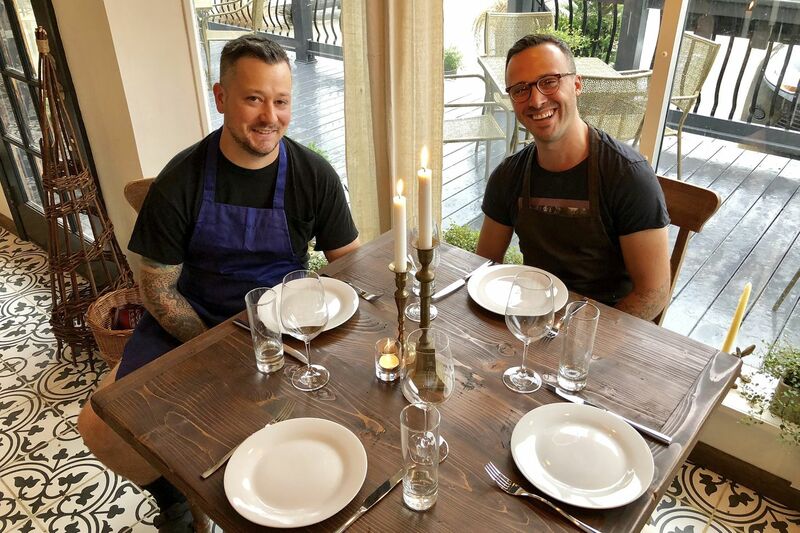 Chef Ryan McQuillan (left) and owner Jason Simkins at Porch & Proper, 619 Collings Ave., Collingswood. Table setting in the window of Porch & Proper, 619 Collings Ave., Collingswood. Collingswood, whose enviable restaurant collection includes such destinations as Zeppoli and Hearthside, is about to get another touch of elegance. Aug. 28 is the scheduled debut of the Porch & Proper (619 Collings Ave., 856-477-2105), taking the former house last occupied by Indeblue. The top-to-bottom redo is the longtime dream of Jason and Casey Simkins, who met as managers at Continental Mid-town while working for Starr Restaurants. Food is chef-driven and seasonal, but approachable. To wit, the "donut and foie" small plate ($15) that pairs two cardamom-sugar doughnuts with luscious, creamy foie gras studded with blueberries and burnt rosemary; you tear into the doughnuts and dip. Dishes at Porch & Proper, 619 Collings Ave., Collingswood, include (from top) garganelli with pork sugo, the bread service and tallegio tortellini, and doughnuts with foie gras. Menu is online but is unpriced; dishes range from $5 for the bread service to $42 for a veal chop Milanese served with potato salad, baby lettuces, parsley aioli, and red onion, but there is a lot in between. The garganelli you see in the photo, for example, is a substantial portion priced at $18. Hillary O'Carroll of Chestnut Hill's Isabella Sparrow went for European rustic , using assorted antiques, butcher-block tables, sheer curtains across the front windows, black-and-white porcelain tiles, votives and tapers on the tables. Twenty seats are on the front porch; those seats are first-come, first served. As for the name: Jason Simkins says he always wanted to open a restaurant called The Parlor. But then, he says, he and Casey saw the building, and they decided that "porch" had to be in the name. "And then I realized that 'parlor' should be dark and intimate," he says. "This is bright." It's BYOB, though wines from Atco's Amalthea Winery will be sold by the bottle. Hours: 5 to 10 p.m. Tuesday to Saturday, 5 to 9 p.m. Sunday. Dining room at Porch & Proper, 619 Collings Ave., Collingswood. Porch & Proper, 619 Collings Ave., Collingswood, is a redo of the former IndeBlue.